1. He’s a very busy player and doesn’t enjoy playing sparsely. 2. His parts have lots of fills and major changes of texture. 3. His fills are dramatic ie., they shock. 4. Listen to everybody else. 5. Develop a new set of clichés. 6. Develop a new vocabulary of drum sounds. 7. Listen to the sound of what you play. Bruford’s autobiography outlines his general attitude to these instructions. But he gamely meets Fripp halfway and adapts his style accordingly, laying off the hi-hats, ride and crash cymbals unless absolutely necessary and adding a set of Octobans, a China cymbal and a few electric drums to his kit. There are other Fripp stipulations. The music’s high frequencies should be saved for the electric guitar (Fripp was perhaps influenced by the ‘rules’ set by Peter Gabriel for his groundbreaking third album) and the 16th notes usually played by the hi-hat or ride cymbal should also now be the guitarists’ responsibility. The formula was set. And one of the great albums (and bands) of the ’80s was born. There was something very exciting in the air around late ’70s/early ’80s rock. The talk was all of ‘village music’ – an African concept wherein each player’s contribution is vital but only a small part of the mighty whole. Talking Heads’ Remain In Light, Brian Eno/David Byrne’s My Life In The Bush Of Ghosts, David Bowie’s Lodger, Japan’s Tin Drum and Gabriel III showed how ‘world’ influences could integrate with ‘rock’ to thrilling effect, and Discipline fits in very neatly with those albums. Musical references might come from Mozambique, Java, China, Bali or South Africa, or from the soundworlds of Karlheinz Stockhausen, Glenn Branca, Philip Glass and Steve Reich. Like Talking Heads, King Crimson filtered these influences through a New York art-rock/post-punk perspective but, arguably, no one integrated them more successfully. Fripp and Bruford recruited Adrian Belew (who chose Crimson over Talking Heads) and Tony Levin in New York. Belew had grown into an incredibly assured vocalist – according to Bruford, he was literally incapable of singing out of tune – and master of unusual guitar textures. His solos featured tones and approaches never heard before. Levin had already played bass with a plethora of heavyweights including Paul Simon, John Lennon and Gabriel, and had also just turned down an invitation to join Weather Report at the beginning of 1981. 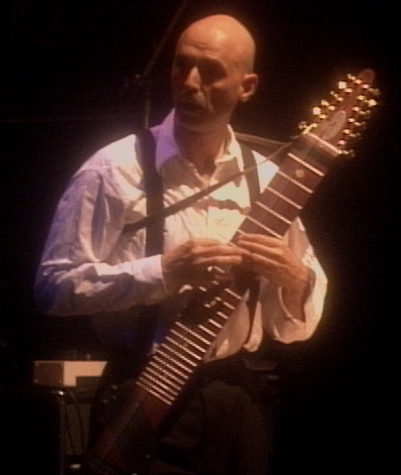 He unleashed a new weapon for the Crimson gig – the ten-stringed Chapman Stick, played by tapping or ‘hammering on’ (heard to great effect during the opening of ‘Elephant Talk’). Back in the mid-’80s, my brother and I used to peruse Discipline‘s liner notes for clues as to the powerful and mysterious music therein. We didn’t have a clue what a ‘Stick’ was, concluding wrongly that it must be the slightly synthetic woodblock sound heard throughout ‘The Sheltering Sky’ and title track (I’m still not sure what that sound is – maybe a ‘triggered’ Bruford hi-hat?). The band wrote an hour of new material fairly quickly and toured modestly in the UK during April and May 1981, calling themselves Discipline. The album of the same name was recorded over the summer at Island’s Basing Street Studio in Notting Hill (later Trevor Horn’s Sarm complex) with producer Rhett Davies, fresh from helming Roxy Music’s Flesh And Blood. By September, pleasantly surprised by the quality of music in the can, Fripp was issuing a lengthy (and fairly incomprehensible) press release explaining why the band would henceforth be known as King Crimson. As Bruford says in his book, ‘For a couple of years at the beginning of the ’80s, we were the right band in the right place at the right time – not to get hits, but to do useful, fascinating and right work.’ He also says that the Crimson drum stool was one of the three best rock gigs in the last few decades of the 20th century, naming the other two as Gabriel and Frank Zappa.